Report: How much did Brazil spend on World Cup stadiums? As many media outlets, we’ve been publishing articles about alarming delays and additional costs of the 12 World Cup venues. But that, as experience teaches us, is a big part of every mega event like this. 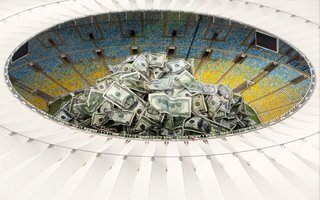 Looking at the numbers it’s easy to say why people in Brazil are frustrated with what they’ll soon be left with: in 2010 the country expected to spend roughly R$6 billion on host stadiums, but ended with 8.535 billion. Interestingly, though, due to exchange rates both numbers represent a quite similar value in US$: 3.40 and 3.86 billion. For Brazilians it’s still over 41% more than anticipated, thus the public outcry seems justified. Statistically every stadium was R$207 million more expensive than was hoped to be and cost on average a whopping R$711 million. Why such an immense increase in pricing? As can be expected from such a complex project, there are many factors. Design changes, construction delays, supposed corruption – we all heard those. Some were confirmed, too, as Tribunal de Contas, Brazilian Court of Audit revealed public authorities were sometimes charged twice for the same works, some materials were suspiciously counted as lost in the building process. But apart from potentially shady side of the business, also major economic changes in Brazil played an important role. As an example, the country recently saw a record low in unemployment (4.3% in January). While this is rate is only partially true with many people being outside the system, it also means that cost of labour went up, even if often forced by strikes delaying the stadiums. Also, exchange rates of the Brazilian currency were very dynamic and while the real was getting weaker over the past years, importing any materials from outside the country/continent was getting pricier. Hosting the world’s largest football tournament costs a lot, even if the stadium expenses are a minor figure in Brazil’s annual budget. But when education and healthcare show significant shortages while social stratification grows, outrage and street protests weren’t hard to predict. Still, the average price of R$711 million ($321.2m) per stadium isn’t higher than all of the previous tournament venues. In South Africa that figure is over $326m, while in Poland every Euro 2012 stadium cost $360 million. Compared to other World Cup holders the Brazilian stadium cost is of course still very high, with R$12,971 (or $5,860) per seat built. This means that the hosts are only slightly over South Africans (2010) and the Japanese (2002), while only the Germans (2006) managed to keep a very cost-effective budget. According to current exchange rates and including inflation, Brazil still looks like a modest host when compared to Russia. Though some stadiums are yet to see groundbreaking, each seat at the new 2018 World Cup stadia is expected to cost some $11,600! When we look at the most expensive stadiums built for any recent World Cups, Brazil has three venues in the top 10, just like Japan and South Africa, while Germany built only one arena expensive enough to compete. Public, private, but is it payable? Former sports minister Orlando Silva is very often quoted to have said that none of the World Cup stadiums will cost taxpayers their hard-earned money. His words are now used against him as the Brazilian government faces great criticism. In fact, the goal of having only private funds involved in stadium construction was unreachable from the start. Experience shows that even with strong football and entertainment markets most stadium expenses still fall onto the taxpayer. Of all 35 stadia built for World Cups in 2002, 2006 and 2010 a massive number of 31 were built by public authorities, while only 2 were public-private projects and further two entirely or mostly private. This may serve as consolation for many Brazilians. While their country failed to achieve the unrealistic 100% private rate, Brazil is still the single country with most stadiums having private contributions of all World Cup hosts. Only 4 stadiums were built entirely with public resources (Arena da Amazonia, Arena Pantanal, Estadio Nacional, Maracana), while further 5 are public-private partnerships (Mineirao, Castelao, Arena das Dunas, Arena Pernambuco and Arena Fonte Nova). Private input in each case varies, but mostly follows a concession model, in which the investor may retrieve part of the invested funds through a share in revenue. Shortest concession will last 8 years (Castelao), while the longest spans over 35 years (Arena Fonte Nova). In short this means that every BNDES loan needs to be paid back. In the case of three private projects it’s the responsibility of clubs (Corinthians, Atletico Paranaense and Internacional) and their commercial partners. With other stadiums it’s mostly the responsibility of state governments, which still means taxpayer money. Some analysts already suggest not all debts are possible to be retrieved and some will have to be remitted. But others, most notably BNDES itself, assure that every partner had to provide substantial guarantees before being granted any loan. Participating in the construction cost is one thing, but operating a profitable stadium in the long run is a different challenge. According to last year’s analysis by Tribunal de Contas 8 arenas shouldn’t have a problem with breaking even. But four are indeed at risk of becoming white elephants, with Estadio Nacional leading the pack as the most expensive stadium in the country’s history. Thankfully, the remaining three are much smaller (two also possible for partial reduction) and won’t become large burdens for their respective state authorities. What will future bring for each and every one of them? We'll keep you updated when operating figures are available!